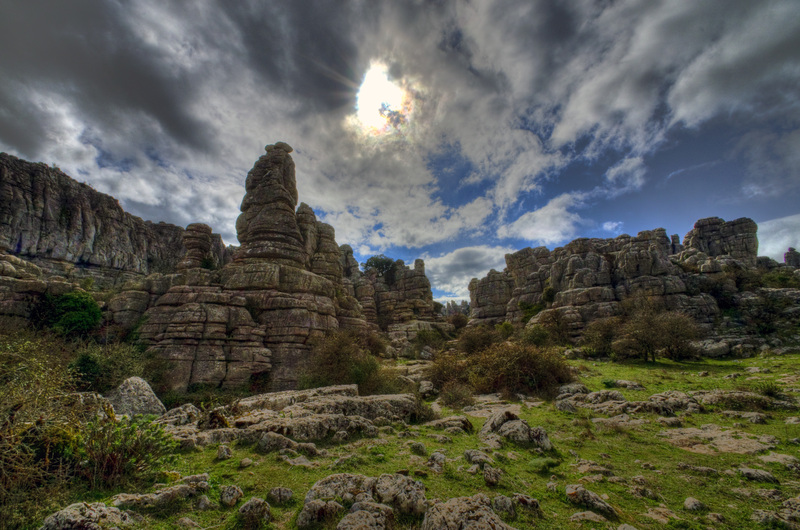 The “Sierra del Torcal” (or El Torcal) is a small mountain range separating the cities of Antequera and Málaga. It is known for its unusual landforms, and is one of the most impressive karst landscapes in Europe. The area was designated a Natural Site of National Interest in July 1929, and a Natural Park Reserve of about 17 square kilometres in October 1978. The Jurassic age limestone is about 150 million years old and was laid down in a marine corridor that extended from the Gulf of Cádiz to Alicante between the present Atlantic Ocean and Mediterranean Sea. These seabeds were uplifted to an elevation of over 1300 meters during the Tertiary era, resulting in a modest mountain range of flat-lying limestone, which is rare in Andalucia. Later, a series of fractures, cracks and faults at right-angles were exploited by erosion and produced the alleys between large blocks of limestone visible today. Like many massive limestones, the Torcal includes caves and other underground forms, some of them of historical importance like the Cueva del Toro (Cave of the Bull) with its Neolithic artifacts. Their origins are also related to the dissolution of underground limestone by rainwater. The Caves of Nerja (Cueva de Nerja) are a series of caverns in Maro, close to the town of Nerja (50 km to the East of Málaga). 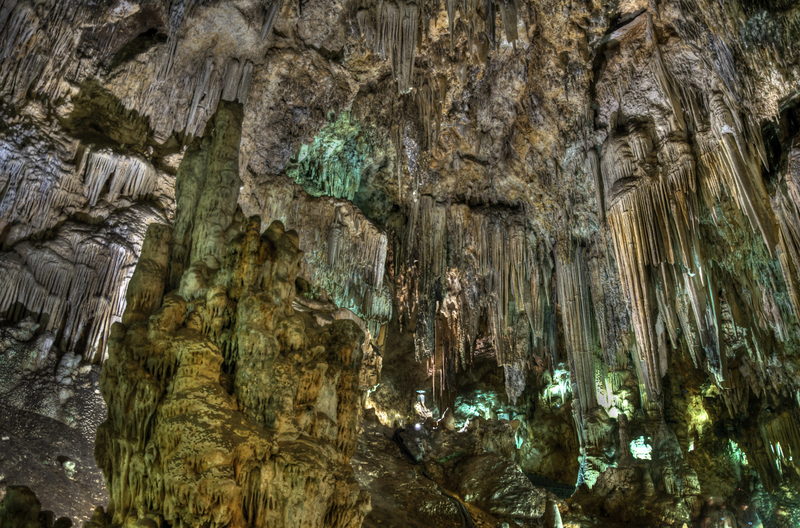 Stretching for almost 8 kilometres, the caverns are one of Spain’s major tourist attractions. Concerts are regularly held in one of the chambers, which forms a natural amphitheatre. Skeletal remains found in the caverns indicate that they were inhabited from about 25,000 BC up until the Bronze Age. The caves were re-discovered in modern times on 12 January 1959 by five friends, who entered through a narrow sinkhole known as “La Mina”. This forms one of the two natural entrances to the cave system. A third entrance was created in 1960 to allow easy access for tourists. The cave is divided into two main parts known as Nerja I and Nerja II. Nerja I includes the Show Galleries which are open to the public, with relatively easy access via a flight of stairs and concreted pathways to allow tourists to move about in the cavern without difficulty. Nerja II, which is not open to the public, comprises the Upper Gallery discovered in 1960 and the New Gallery discovered in 1969. In February 2012 it was announced that possibly Neanderthal cave paintings have been discovered in the Caves of Nerja. (click here). To go to the website, click here. 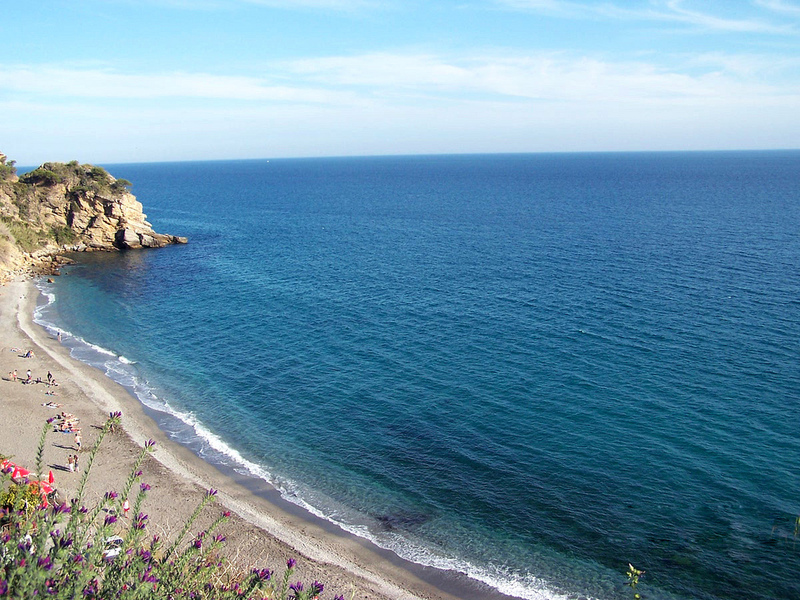 This is a unique stretch of near-virgin coastline in Malaga, which runs for 12km east of Nerja to La Herradura in Granada province and covers an area of 1,815 hectares, including a protected part offshore. Its dramatic rocky steep cliffs (up to 75 meters of vertical) plunge down to the sea, leaving a few sheltered bays with beaches in between, which can be accessed via staircases or tracks. Located on very edges of the Sierra Almijara, these limestone outcrops have been eroded by the sea and weather into fantastic shapes, with offshore stacks and arches and undersea caves. Its popularity with visitors particularly in the summer months means that the beaches can get overcrowded. Camping on the beach, fishing in the protected waters and driving motor vehicles down to the coves and beaches in the coastal park are forbidden. You can take a bath in amazing crystal clear waters where live endangered species as star coral. We can also find protected species such as the loggerhead sea turtle (Caretta caretta) and cetaceans such as the short-beaked common dolphin (Delphinus delphis), striped dolphin (Stenella coeruleoalba), common bottlenose dolphin (Tursiops trucantus), fin whale (Balaenopteraa physalus). We are 6 volunteers from Portugal, Spain, Italy, Poland and Republic of Macedonia who work together with Fundatia Pro Prietenia in Arad (Romania) in this project. The project promotes such values as the human rights, fighting against discrimination and human trafficking, the right of education, civic participation.